"While 111 cubic kilometres of ice disappeared per year in 2003, 10 years later this figure had almost quadrupled to 428 cubic kilometres," the Technical University of Denmark (DTU) Space Lab said in a statement. Its researchers contributed to a study on changes to Greenland's ice sheet, published in the US journal Proceedings of the National Academy of Sciences (PNAS). "These are notable and surprising changes we are seeing in the ice melt pattern," DTU professor Shfaqat Abbas Khan said. But most of the ice loss from 2003 to 2013 was from Greenland's southwest region, which is largely devoid of large glaciers. 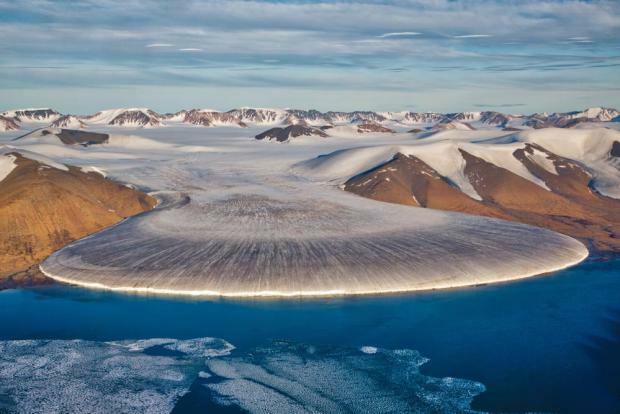 Michael Bevis, a professor at Ohio State University and lead author of the PNAS paper, said the ice now appeared to be melting from the surface mass, "melting inland from the coastline." "We knew we had one big problem with increasing rates of ice discharge by some large outlet glaciers," Bevis said. "But now we recognise a second serious problem: Increasingly, large amounts of ice mass are going to leave as meltwater, as rivers that flow into the sea." "We are watching the ice sheet hit a tipping point," he said, which would condemn the entire giant ice block to melting over a time scale of hundreds, or several thousand, years. The Greenland ice sheet - up to three kilometres thick - contains enough frozen water to raise global sea levels some six metres. "As the atmosphere's temperature gradually rises, we will immediately notice an acceleration of the ice melt," Khan said. While the amount varies from region to region, sea levels rose worldwide by an average of 20 centimetres in the 20th century. They are currently rising by about 3.3 millimetres per year.